Playing a musical instrument is good for the mind, body, and soul. Not only does having a passionate hobby tend to make people happier, learning to play an instrument also has positive affects on the brain and memory retention. If you have some extra cash lying around and have a hankering for purchasing your first acoustic guitar, there are some very good options for under $500. Informing yourself on different brands, their features and benefits, is the first step to ensuring you end up with the perfect musical match. The Gretsch Rancher Jumbo Cutaway was introduced in the 50s and has built up a solid reputation ever since. The Gretsch name has longevity on its side and is synonomous with craftsmanship, style, and perfect projection. Well suited to rock and roll, the Gretsch guitars are known for their power and deep resonance. This guitar comes in at just under the $500 mark, but it is well worth it and is a prime case of getting what you pay for. 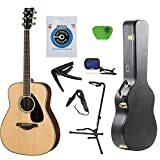 Its style and look is hard to match, so if you are looking for an acoustic to perform with, this is by far one of the best choices out there for less than $500. The Fender FA-100 is the ideal choice for beginners, and no doubt, even the newest of players has heard the name ‘Fender’. The Fender FA-100 is known as one of the best beginner options around. The strong dreadnought body gives off a huge sound and perfect bass. It comes complete with a padded gig bag, which is a great perk for protecting and preserving the Fender against weather changes and bumps and scratches. This guitar will not disappoint. For under $200, this guitar would make a perfect introduction into the world of guitar playing. This Martin steel string backpacker is ideal for those on the go. It can fit into a backpack for ease of transport, and that ‘Martin’ name is another trusted one. This travel guitar features a mahogany neck, sides, and back and produces crisp clear tones that are unmatched by instruments in higher price ranges. This guitar is ideal for sitting around the campfire or taking along with you on a trip. Available for purchase at $250 and lower, depending on where you purchase it from, this Martin is perfect for those hard-core nomad musicians. The Taylor Big Baby is just under a full-sized guitar and has the same playability of any guitar that boasts the ‘Taylor’ name. Known for its simple ease and comfort, the Taylor name is known for its smooth and rich sounds at affordable prices. Available to purchase for around $400, the Taylor Big Baby has a lovely Sitka spruce top that produces a rich and well-rounded sound that is hard to match even with guitars that are not so reasonably priced. Purchasing a Taylor also has the added bonus of coming with a gig bag, so for those who plan to travel with their Baby, it is protected from weather changes and bumps and scratches while on the road. The Ovation celebrity features a unique body with a rounded shape that results in a precise and focused tone. While some find the rounded shape a challenge to play while sitting down, most recommend some non-slip tape to help hold it in place and find that the sound quality makes up for any awkwardness in the holding. 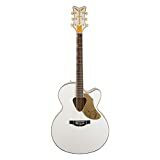 For just under $400, the Ovation Celebrity is a great choice for those wanting a guitar with a unique sound and look. This guitar is known for a strong stage presence as guitar greats like Cat Stevens favored the design and sound. The Washburn WD150SW is perfect for those just starting out on their guitar-playing journey. Washburns are known for their warm and intimate sound. The mahogany and cedar body produces perfect resonance ideal for fingerpickers. The cedar top is also known to break in faster than other wood choices, revealing the guitar’s tonal potential long before other guitar choices. For around $250, this Washburn is a great choice for beginner guitarists who aim for fingerpicking greatness. When you embark on your quest for the best acoustic guitar, you will want to find one that matches your skill level, budget, and musical style. Walking into a music shop for the first time and seeing the wealth of different guitar types and brands there are can be overwhelming, but don’t lose heart. While guitar makers range in the kinds of woods they choose, design, and hardware, there are some main areas to focus on when looking for the best acoustic guitars under $500. Perhaps the first thing you should ask yourself is how much you want to spend. While it is more than easy to spend more than $500 on a guitar, there are still many appealing options for under $500. So with your budget of under $500 set, you need to consider your playing skill level. For beginners looking for an instrument to learn on, there is no reason the many good- to low-range guitars wouldn’t suit your needs. It is recommended for beginners to start small and work their way up. Once you have learned on an ideal beginner guitar that didn’t break the bank, then you will really know what you want and which guitar will compliment your playing strengths while minimizing any weaknesses you have. For more experienced players looking to upgrade their current guitar, the main difference to consider are the different tonewoods and the soundboard resonance. With more experience, you will know which tonal qualities and sounds you prefer. What Kind of Purpose Does your Guitar Purchase Have? Next, you will want to think about what type of playing you will be doing. Are you playing alone, or in a band? Are you planning on participating in public open-mic nights? If you are planning on playing on a stage or with others, an acoustic-electric guitar is likely your best choice. Acoustic-electric guitars feature a pickup and built-in preamplifier so they can be plugged into a sound system or amp to preserve the purity of their acoustic sound. Acoustic-electric guitars are rising in popularity as they can be used as a regular acoustic when not plugged in, while still giving players the option of stage-quality playing with an amp. Hybrid guitars are versatile, and if you are not 100-percent sure which type of playing you will be doing, you are covered for both solo or with a band on a stage environment. When it comes to playing in your preferred musical style, you will want to choose a guitar that has the right sound that best complements that style. While most acoustic guitars share the same basic principles of design, there are some differences that result in different tonal qualities and playability. Some of these variables include body styles, tops, neck length and width, nylon or steel strings, and tonewood. The body design of the guitar is important as you need to be comfortable holding and playing it. Make sure you sample the guitars in different positions like standing and sitting. You will need to try out a number of guitars to find one that feels natural and comfortable for you to play and hold. Once you find that guitar that is the perfect fit, it will feel like an extension of your body, and that will make it an ideal guitar to learn and progress on. The design of the guitar’s neck will not necessarily affect the sound the instrument produces, but it will affect your comfort and confidence when it comes to holding and playing the instrument. When you are looking at the different necks, here is what you need to know: necks are listed as either 12- or 14-fret. The number represents the number of frets above the guitar body, not the neck’s total number of frets. On the 12-fret necks, the last two frets are on the body and harder to reach. For players with smaller hands or shorter fingers, they would be better suited to guitars with smaller necks so their hands and fingers don’t need to stretch as far; 14-fret necks would be ideal. While some people will tell you that new players should always start with nylon strings as they are easier on the fingers, that is a misconception. Nylon and steel strings are not interchangeable, so starting with one and progressing to the other is not an option. What should determine your string choice is the style of music you enjoy and intend to play. Nylon strings produce softer sounds for a more mellow tone. These sounds are popular in classical and folk music. Steel strings are ideal for playing country, rock and pop music and are more commonplace. They produce a louder brighter sound than the subtle mellow tones of nylon strings. The variety of woods different guitars and guitar parts are constructed from can seem overwhelming; the important thing to understand is that different woods produce different sounds. Below are the most common types of woods used in guitar construction and their corresponding sounds. Cedar is known as a soft wood that results in a bright tone. This sound is ideal for flamenco or classical playing styles. Cocobolor is a tropical exotic hardwood used mostly in guitar sides and backs; it results in fast and bright sounds. Ebony is ideal for fretboard material as it is strong and slick – perfect for sliding fingers along. Granadillo wood is less common and most often is used for the guitar’s back and sides. It gives off a clear ringing sound. Koa is ideal for mid-range tones. It is a versatile wood used in most guitar parts but is most often used on higher-end guitars due to its rarity. Rosewood is one of the most popular wood choices for guitars as it produces a rich sound with distinctive notes. It projects tone perfectly and is one of most popular choices for guitars. Spruce is a common choice for the guitar tops as it is lightweight and strong. It produces clear sounds and the numerous spruce varieties include Sitka, Adirondack, Engelmann and European Spruce. Each type has distinctive tonal qualities. There are about as many different guitar brands as there are guitar looks, but as far as top guitar brands for acoustic guitars under $500, the most popular and highly regarded include Seagull, Takamine, Epiphone Texan, Breedlove, Taylor, Washburn, Ovation, Martin, Fender, and Gretsch. Most often, the most popular brands are popular for a reason, and this is an example of when player recommendations come in very handy. Rather than sift through the masses of different acoustic guitar brands out there, you can narrow it down by focusing on those names that feature strong branding and are built on trust. So there you have it! You can indeed find the perfect guitar to suit your needs for under $500. Like most things in life, a little research beforehand has a big payoff in terms of getting exactly what you need for the most affordable price. Whether you are a complete novice or have some guitar-playing experience, there is just the right instrument out there waiting for you to pick it up and fall in love one strum at a time. From size and shape to string choice and craftsmanship, finding a guitar that is just perfect for you should make you feel like you have found your ideal musical match.